An exciting new series of middle-reader adventures – meet this modern neighbourhood gang with all the charm of the Famous Five. Brisbane-dwelling teenager Katie Crisp has talent, it's just that the report card hidden in her room doesn't show it. School's out for another year and Katie is set to spend the summer lazing under the sausage tree in the backyard of the only home she's ever known. So, when she discovers that Parfitt's Family Soft Drink Company is about to be taken over by a corporate giant, leaving her mum out of a job and them both out of a home, Katie decides it's time to finally show everyone what she's made of. With her nose for trouble and her eye for advertising, and a little help from some neighbourhood friends, Katie declares Mosquito Advertising open for business. Pocket money and creative thinking can stretch a long way when everything that means anything to you is about to be destroyed. Kids today find themselves surrounded by advertising of every type: TV and magazine ads, billboards, sponsored sporting events, branded clothing, promotions - and more! They're saturated from the cradle like no generation before and just what they absorb is a subject of concern for many, but it's what they observe that will really surprise you! In the 'Mosquito Advertising' series, an enterprising group of everyday young teens turn advertising on its head. Rather than being passive receptacles of the persuasive message, they demonstrate they've dissected multi-faceted marketing with a critical eye, discovering they can develop fresh and catchy campaigns. Combining their various skills and talents, Katie and the kids on her street counter holiday boredom with ingenuity and enthusiasm. The advertising they produce using accessible computer technology, free services like YouTube, and creative verve, are eye-openers! 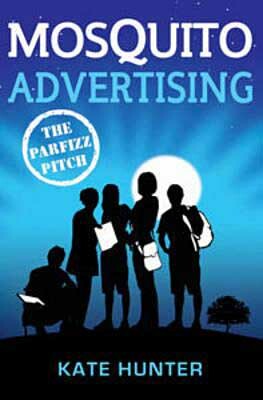 These suburban teens have their everyday demands of homework, changing friendships and parental expectations, but a common goal and the opportunity to showcase just what they can do, make for exciting challenges in the big business of marketing. There is often an unexpected turn of events, but ultimately, the way Katie and her friends meet these challenges demonstrate their individual resilience and bring out the group's best qualities. A great read with a mix of realistic characters and entertaining storylines, 'Mosquito Advertising' empowers those who often seem the most susceptible, not only by showing what can be done, but in making them more discerning about what goes on behind the scenes in the world of persuasion.